An extracellular matrix created from the urinary bladders of pigs, combined with offloading, has shown “significant” promise in treating diabetic foot ulcers, according to a recent study. President Trump’s first proposed budget chops 18% from Department of Health and Human Services funding and adds millions of dollars to combat healthcare fraud for fiscal 2018. Residents at The Terraces at San Joaquin Gardens, a continuing care retirement community in Fresno, CA, gathered in February for a bingo game unlike any other. Patients with anxiety or depression may be at a higher risk of developing wound complications after surgery, according to a recently published study. 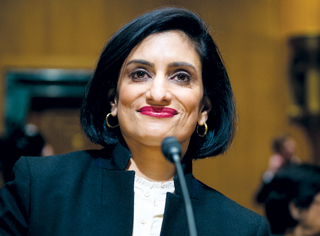 Long-term care provider groups were complimentary of Seema Verma following her mid-March confirmation as administrator of the Centers for Medicare & Medicaid Services. Reader Poll: What is the best thing your manager does to help you in your job? Can you help us improve treatment of diabetic foot ulcers? A medication reconciliation program may help reduce hospital emergency room readmissions by as much as 6%, a recent study shows. Where’s the indignation been from providers? Finally. That was my immediate, silent reaction when I received the email from a top long-term care provider. As pesky questions about the future of healthcare swirl, let’s give thanks for the one, and maybe only, inviolate cog in the long-term care machinery that’s beyond the power of politicians to regulate or obliterate — kindness.